(Original Caption) Mrs. Martin Luther King, Jr., comforts her youngest daughter Bernice, 5, during services in the Ebenezer Baptist Church, 4/9. The proverb says that April showers bring May flowers. T.S. Eliot preferred the darker side, proclaiming April the “cruelest month.” For journalists, April showers can also mean Pulitzer Prizes. This April also marks 50 years since the murder of Martin Luther King Jr. on April 4, 1968, and thus 50 years since the publication of a famous photograph showing the grieving widow of the fallen martyr. 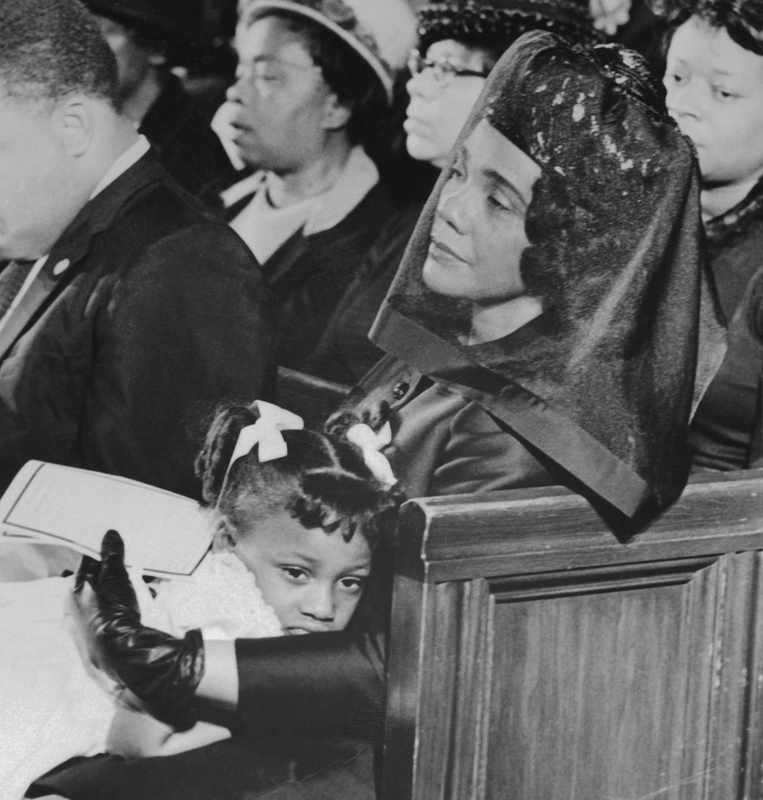 Coretta Scott King mourns at the funeral of her husband, her little daughter Bernice resting her head upon her mother’s lap. That iconic black-and-white image of the veiled widow was taken by a man named Moneta Sleet Jr. (For the record, he used a Nikon camera with a 35 mm lens, with Kodak Tri-x film.) The following year, 1969, Sleet received news that he had been awarded a Pulitzer Prize. At that moment, Sleet became the first black man to win a Pulitzer and the first African-American journalist to win one as an individual rather than as part of a journalism team. It was in 1947, remember, that Jackie Robinson (whom Sleet also photographed) broke the color line in baseball. 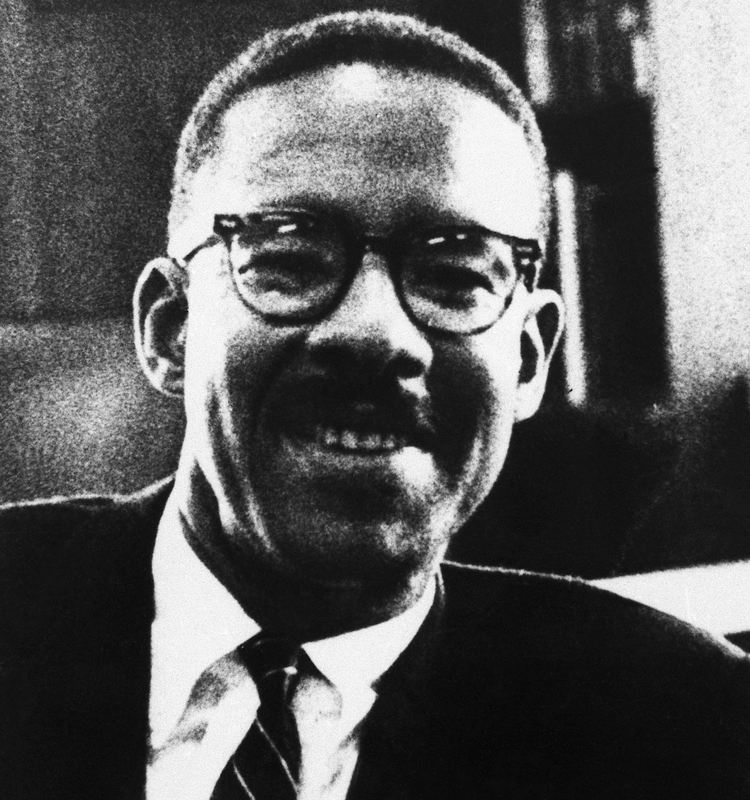 It took another 22 years before a black man crossed that line in the Pulitzer competition. From 1955 until his death in 1996, Sleet worked for the Johnson Publishing Co. His images, especially in Jet and Ebony magazines, documented every step of the civil rights movement. Beyond that, he captured the work and achievements of black celebrities, performers and politicians in every corner of the country — but also in Africa and around the globe. Sleet’s eyes were not on a Pulitzer Prize but on a higher calling: to document the life and times of a marginalized and persecuted people in all aspects of their lives, through triumphs, troubles and tragedies. Mrs. Martin Luther King, Jr., comforts her youngest daughter Bernice, 5, during services in the Ebenezer Baptist Church, 4/9. “There was complete pandemonium. Nothing was yet organized because the people from SCLC [Southern Christian Leadership Conference] were still in a state of shock. We had the world press descending upon Atlanta, plus the FBI, who were investigating the assassination. “We were trying to get an arrangement to shoot in the church. They were going to pool it. Normally, the pool meant news services: Life, Time and Newsweek. When the pool was selected, there were no black photographers from the black media on it. Lerone Bennett and I got in touch with Mrs. King through Andy Young. She said if somebody from Johnson Publishing is not on the pool, there will be no pool. “We … made arrangements with AP that they would process the black and white film immediately after the service and put it on the wire. Later, I found out which shot they sent out. … The day of the funeral, Bob Johnson, the executive editor of Jet, had gotten to the church and he beckoned for me and said, ‘There’s a spot right here.’ It was a wonderful spot. In a profession whose practitioners are expected to bring a certain detachment to their work, Sleet saw no reason to apologize for his commitment to the cause of racial equality or for his emotional involvement with those he photographed. “I wasn’t there as an objective reporter,” he once said. “I had something to say and was trying to show one side of it. We didn’t have any problems finding the other side.” The side of racism and intolerance. At the time, magazine features were not eligible for Pulitzer Prizes. Sleet’s image became eligible because of its distribution by The Associated Press. As an African-American, a photojournalist, a pastor, and a father, what do you see when you look at the famous photo taken by Moneta Sleet? I see great pain and promise in this photograph. Moneta gave me a copy in 1996 after the Olympic Games, which was his last major assignment. For me, it’s the obvious pain for the murdered martyr for justice and peace. I see the promise in his daughter Bernice, who would pick up the baton of her father’s work. And I see the promise affirmed by Moneta’s Pulitzer Prize, an honor which paved a path for me and generations of other photojournalists. This is a black-and-white photograph. What do you see technically that interests you? The elegance of the black-and-white composition has long transfixed me. I love the stark white dress of Bernice, juxtaposed against the black dress and glove. Then there are shimmering shades of gray that flow from the veil throughout the photograph. Yet, the sadness of the eyes in the photograph says all that needs to be said. Access is so important to any successful photojournalist. What did it take for a black photographer in the 1960s to get access to important social and political events? That’s a really great question. It took courage and connections. It was actually Coretta who took the bold stand and insisted that Moneta would be the pool photographer while there was one other photographer inside. Flip Schulke, who was white, also had a relationship with Dr. King. For Jet and Ebony magazines, Sleet covered the civil rights movement, issues related to Africa, the black social and celebrity scene. How would you summarize his contribution to journalism? Simply put, he was one of the trailblazers — a tremendously kind human being, a great journalist and nurturing mentor to many.